Quentin Vennie shouldn’t be alive—he has walked a path that many don’t live long enough to write about. Growing up in Baltimore, he was surrounded by nothing but dead ends. Statistics mapped out his future, and he grew hostile toward a world that viewed him with suspicion and disdain. He was shot at, sold drugs up and down the East Coast, lingered on the brink of incarceration, and stared down death more than once. Haunted by feelings of abandonment and resentment, he struggled with chronic anxiety and depression and battled a crippling prescription drug addiction. The day he contemplated taking his life was the day he rediscovered his purpose for living. Vennie’s survival depended upon his finding a new path, but he didn’t know where to turn—his doctor was concerned only with prescribing more medication. Vennie refused, and in a desperate attempt to save his own life, decided to pursue a journey of natural healing. After researching a few self-healing methods, he immediately bought a juicer from an all-night grocery store. He started juicing in the hopes that it would help him repair his body and clear his mind. He jumped headfirst into the world of wellness and started incorporating yoga and meditation into his life. This “wellness trinity” helped him cut back on and then quit the many medications he was on, overcome his addictions, and ultimately, transform his life while inspiring others to find their own unique path to wellness. 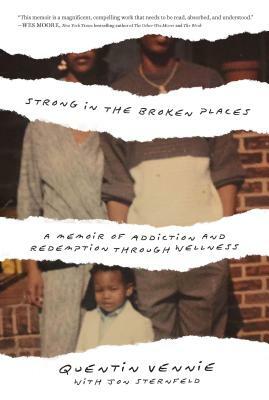 Strong in the Broken Places is the harrowing story of Vennie’s life, the detours that almost ended it, and the inspiring turns that saved it. The odds were stacked against him, but he was able to defy expectations and claw his way out on his own terms. He is living proof that during our weakest moments, we have the power and ability to unlock unimaginable strength. Quentin Vennie is a wellness expert, speaker, and mental health advocate. After years of struggling with poverty, anxiety, depression, and addiction on the streets of Baltimore, he set out on a journey to heal himself. He was able to do so through his Trinity of Wellness system—a combination of yoga, meditation, and fruit and vegetable juices. He has written for the Huffington Post, MindBodyGreen, Thrive Global, Mantra Yoga + Health magazine, and more. He lives in New Jersey. Jon Sternfeld is a writer whose work includes Crisis Point: Why We Must—and How We Can—Overcome Our Broken Politics in Washington and Across America with Senators Trent Lott and Tom Daschle and A Stone of Hope: A Memoir, with Jim St. Germain. He lives in New York. "Quentin Vennie's life serves as an unfiltered, authentically beautiful guide on how to overcome vices in order to achieve victories. The raw storytelling pushes readers to consider how we can all change our lives for the better. This memoir is a magnificent, compelling work that needs to be read, absorbed, and understood."